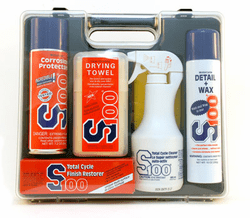 The S100 Motorcycle Detailing Kit includes an assortment of S100 products conveniently packaged in a reusable case. This detailing set is perfect for motorcycle enthusiasts because the products work quickly and deliver outstanding results. You'll be back on the road in no time on a shiny, freshly detailed bike! S100 Total Cycle Cleaner easily emulsifies everything the road deposits on your bike so it rinses clean. S100 Total Cycle Cleaner is a detergent-based cleanser, not a harsh solvent. Spray onto your bike, let it dwell, and rinse off. The S100 Drying Towel is a synthetic chamois engineered to be super absorbent. It maintains its softness through countless uses and it's safe on all motorcycle surfaces. S100 Total Cycle Finish Restorer is a high performance metal polish, paint polish, and plastic polish. Shine chrome and aluminum and remove scratches from paint and plastics. S100 Total Cycle Corrosion Protectant protects paint, metal, plastic, vinyl, and finished and synthetic leather. The clear coating resists rinsing or rubbing off. Prevent corrosion, rust, and oxidation with S100 Total Cycle Corrosion Protectant. Treat your bike right with the S100 Motorcycle Detailing Kit! S100 Total Cycle Cleaner 16.9 oz. S100 Drying Towel 15.7" x 14.5"
S100 Finish Restorer 3.56 oz. S100 Corrosion Protectant 7.2 oz.